In small saucepan, combine all ingredients except meatballs. Bring to a boil. Place meatballs in 2 1/2 to 3-quart slow cooker. Stir in preserves mixture. Cover; cook on High setting for 4 hours, stirring twice. Stir well before serving. Curry powder is a British invention meant to replicate the seasonings ground fresh daily by cooks in southern India. Madras curry powder is extra-hot. Prepare the meatballs and refrigerate up to two days in advance. To freeze, prepare the recipe and place in freezer container; freeze for up to one month. To serve, thaw meatballs and heat as directed. 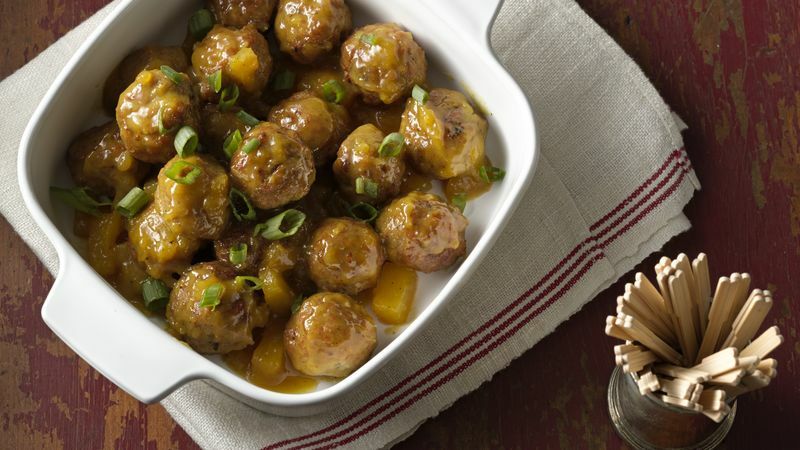 Use a slow cooker to serve meatballs during a party. Hot meatballs can be held for two hours in a slower cooker set on low with the lid removed. Provide small forks, pretzel sticks or cocktail toothpicks for easy eating.